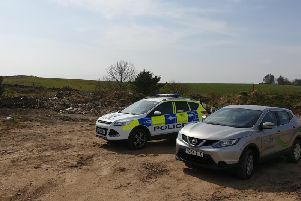 Police Scotland is appealing for information following a fire discovered at a derelict farm building at the junction between the B979 Newmachar to Kingseat and the A947 Whiterashes to Newmachar roads. Emergency services were called to the building, which is opposite the Newmachar Hotel, in the early hours of this morning (Monday May 22). It was extinguished by personnel from the Scottish Fire and Rescue Service who contained the damage to one building. PC Emma Strachan, who is leading the investigation, said: "There is a possibility that this fire had been smouldering for some time prior to being discovered. "I would ask that anyone who saw anything suspicious in the area, or who is aware of any people who may frequent the premises, to please contact 101. "You can also contact Crimestoppers on 0800 555111 if you would prefer to remain anonymous."